This article was first published to Power Retail. We've been asked by numerous people how we've gone about hiring such a great team of people in our office in China. It's a story primarily of spending lots of time on the ground in China with some luck thrown into the mix, so I thought I'd share it in case it helps anyone else doing business in China. In the months prior to launching Shoes of Prey, Mike and I planned to rent an apartment and spend a month each in China to get our processes and systems in place with our suppliers. Mike had spent 6 months in Shanghai working for Google and made the excellent suggestion that we should hire someone for 2 months to translate and assist us while we were in the country. When he was in Shanghai Mike had made a few local friends and one of them, Alice, was between jobs, so we hired her to come down to Guangzhou to work with us while we were in the country. We quickly realised that having Alice work with us was critical to the business and making us much more efficient. She could act as a translator when we were speaking with suppliers of things like shoe boxes, business cards, packaging materials etc. She could then manage the process of receiving samples, ordering and paying for these products. Prior to launching Shoes of Prey we thought we'd just have our suppliers drop ship our shoes directly to our customers. We quickly realised we needed to add in our own quality control step and if we wanted to do things like photograph our shoes for our customers we'd need to do this step ourselves, so Alice was able to take on these tasks. Alice had always planned to head home to Shanghai at the end of 2 months so when we realised that having someone on the ground with us was so critical for our business we asked Alice to advertise for a permanent role with Shoes of Prey in Guangzhou. 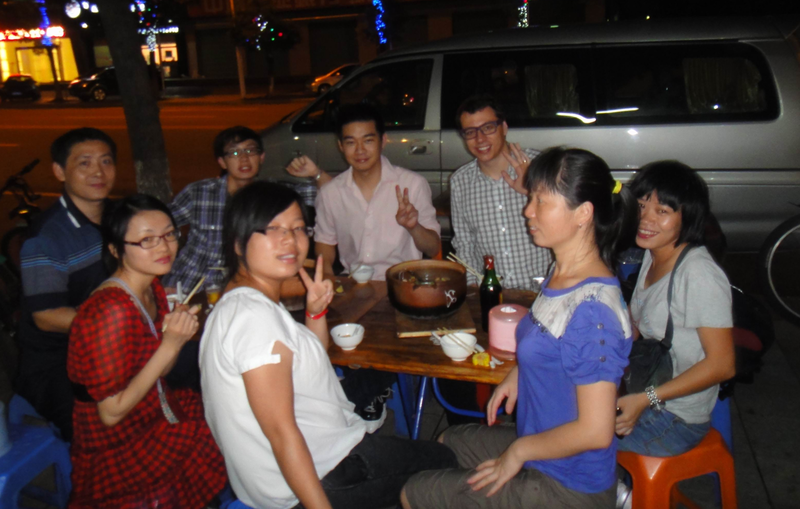 Alice used a Guangzhou based jobs site, similar to Seek in Australia. After reviewing 20 applicants and interviewing 5 people, we hired Vanessa, our first permanent employee. Vanessa proved to be an amazing hire. She was incredibly hard working, diligent and had excellent attention to detail and after only a few weeks training she was fine to take over our Chinese operations when Mike and I both returned to Australia. We used Google Docs and Gmail video chat to keep in regular contact with Vanessa. 5 months later our sales had grown to the point where there was too much work for just one person in China. We asked Vanessa to advertise to hire an assistant to work with her. We left this hiring process entirely to Vanessa and using some local job boards she hired Qun to work with her. Qun also proved to be a great worker. 4 months later Mike was in China again. He was having dinner with one of our suppliers and one of the waitresses impressed him with her attitude to her work, her friendliness and her excellent English skills. Jodie and I interviewed her over video chat and Penny became our third hire in China. At the same time we hired Penny we moved our office about 150km from where it was located in Guangzhou. Qun was happy to make the move but Vanessa missed her friends to much so decided to stay in Guangzhou. To replace Vanessa he asked her to advertise on a local job website and through that we hired Holly. The business continued to grow so we asked the team how we should go about hiring the next person. Penny had a good friend from school who was living in the area and spoke excellent English so we all interviewed Jophie and agreed she would make an excellent hire, so she joined the team. Next we wanted a skilled shoe maker to assist us with our quality control processes and operations in China. We talked to a number of different suppliers we had worked with in the shoe industry to find out if they knew anyone who would make a good hire. After a number of interviews one of the manager's working for one of our suppliers recommended James who was an excellent fit and joined the team. At this point managing our team in China was taking up a significant amount of Jodie, Mike and my time so we decided we needed to hire a manager for our China office. This proved to be a much harder hire to make. We tried contacts from our suppliers. We paid a recruitment firm to assist us. We interviewed about 6 or 7 excellent candidates who just weren't quite the right fit. A few weeks before we started this process a reader of our 22michaels blog, Matt Ho, had noticed that I was in China, as was a friend of his from high school, Ken Chan. Ken and I caught up for dinner and got on really well. As we were going through the process of trying to find a manager it clicked, 'What about hiring Ken as a manager?' Ken had grown up in Sydney but could speak Mandarin and Cantonese reasonably well. He'd worked for Accenture for a number of years in a management consulting role and had some great experience managing teams. And to top it off Ken was already living and working in China in the shoe industry! After a month or so of discussion Ken agreed to join us and now manages our team of 7 in China. After having James on the job for a little over a month we realised that there were a lot more quality control and operational processes to work on than we had initially envisaged. Andy was working for one of our suppliers helping to train our team on a number of tasks and we loved his attitude and skill set. Our supplier was ok with us offering Andy a role with us which we did and he accepted. 1. Make the most of any relationships and contacts you have through existing employees, suppliers and even people you meet at restaurants! 2. Like so many things in business, networking is critical. Let people know what you're doing through your blog and your personal and professional networks. You never know who may know someone who might be a suitable hire. 3. Most of all, there's no replacement for spending time on the ground in the new city. Between Mike, Jodie and I we've spent a combined 10 months in China over the last 2 years and without that, we couldn't have hired the fantastic team we have based there today. Very timely post for me Michael. I'm setting up a base in Indonesia and have been spending a good chunk of time shuttling on QF41 over the past year. My experiences so far have mirrored yours. Having a relatively small existing network in Indonesia gave a starting point to work from and meet people through. I've quickly realised that I need a people that to do the tasks which are required and beyond the manufacturing the factories do. Spending time on the ground is crucial. Random or chance meetings can lead to connections that are incredibly beneficial and they don't occur over skype. You have to be put it out there and be open to options that you possibly wouldn't look at on home turf. I'm about to spend 6 weeks there refining manufacturing and quality processes and to add to my team of one so far. Thanks again for the DHL hook up. Hi Scott, interesting to hear you've had very similar experiences. Thanks for sharing and best of luck with the latest trip. I've once again learnt that leaving blog comments late into the eve is fraught with danger and can lead to the impression that English is not my first language!